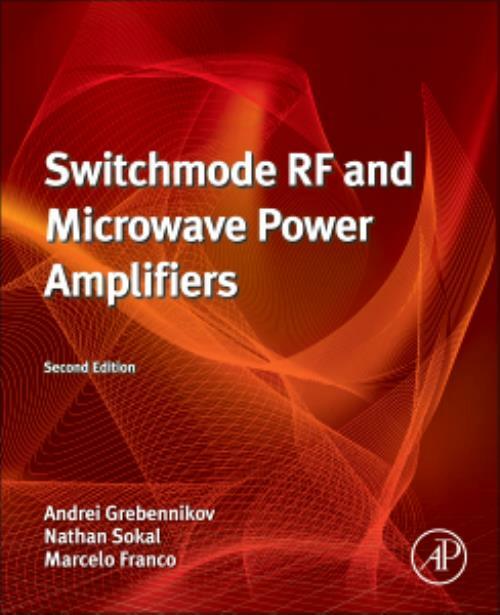 Combining solid theoretical discussions with practical design examples, this book is an essential reference on developing RF and microwave switchmode power amplifiers. Dr. Andrei Grebennikov is a Senior Member of the IEEE and a Member of Editorial Board of the International Journal of RF and Microwave Computer-Aided Engineering. He received his Dipl. Ing. degree in radio electronics from the Moscow Institute of Physics and Technology and Ph.D. degree in radio engineering from the Moscow Technical University of Communications and Informatics in 1980 and 1991, respectively. He has obtained a long-term academic and industrial experience working with the Moscow Technical University of Communications and Informatics, Russia, Institute of Microelectronics, Singapore, M/A-COM, Ireland, Infineon Technologies, Germany/Austria, and Bell Labs, Alcatel-Lucent, Ireland, as an engineer, researcher, lecturer, and educator. He lectured as a Guest Professor in the University of Linz, Austria, and presented short courses and tutorials as an Invited Speaker at the International Microwave Symposium, European and Asia-Pacific Microwave Conferences, Institute of Microelectronics, Singapore, and Motorola Design Centre, Malaysia. He is an author or co-author of more than 80 technical papers, 5 books, and 15 European and US patents. In 1965, he founded Design Automation, Inc., a consulting company doing electronics design review, product design, and solving ''unsolvable'' problems for equipment-manufacturing clients. Much of that work has been on high-efficiency switching-mode RF power amplifiers at frequencies up to 2.5 GHz, and switching-mode dc-dc power converters. He holds eight patents in power electronics, and is the author or co-author of two books and approximately 130 technical papers, mostly on high-efficiency generation of RF power and dc power. During 1950-1965, he held engineering and supervisory positions for design, manufacture, and applications of analog and digital equipment. He received B.S. and M.S. degrees in Electrical Engineering from the Massachusetts Institute of Technology, Cambridge, Massachusetts, in 1950. He is a Technical Adviser to the American Radio Relay League, on RF power amplifiers and dc power supplies, and a member of the Electromagnetics Society, Eta Kappa Nu, and Sigma Xi honorary professional societies. Marc J. Franco holds a Ph.D. degree in electrical engineering from Drexel University, Philadelphia. He is currently with RFMD, Technology Platforms, Component Advanced Development, Greensboro, North Carolina, USA, where he is involved with the design of advanced RF integrated circuits and integrated front-end modules. He was previously with Linearizer Technology, Inc. Hamilton, New Jersey, where he led the development of advanced RF products for commercial, military and space applications. Dr. Franco is a regular reviewer for the Radio & Wireless Symposium, the European Microwave Conference and the MTT International Microwave Symposium. He is a member of the MTT-17 HF-VHF-UHF Technology Technical Coordination Committee and has co-chaired the IEEE Topical Conference on Power Amplifiers for Radio and Wireless Applications. He is a Senior Member of the IEEE. His current research interests include high-efficiency RF power amplifiers, nonlinear distortion correction, and electromagnetic analysis of structures.